In 2001 Brooks Running cut its line of products by 50 percent. Since that time, it is a go-to brand for running gear of all types. Runners at all levels love the simple yet stylish apparel. Their trail running shoes continue to earn praise. They strike an ideal balance between breathable comfort and durable protection that athletes look for in footwear. The original Caldera was able to achieve the balance. Hexagon shaped gripping lugs on the trail-optimized rubber outsole held tightly even on the most rugged terrain. The shoes were not too bulky for paved road use. Its midsole safeguarded the runner from possible hazards while providing durable cushioning. The brightly covered upper offers protection from the elements and proper ventilation. The Caldera 2 kept the features runners loved and provided some much-needed updates. The midsole and cushioning are positive features. The outsole is not a super aggressive outsole with talons like an eagle, but reviewers are happy with how well it holds up in sloppy, raining or muddy weather. Reviewers have put a lot of miles on the shoe, which indicates they like it. It is a go-to trail shoe for long and short distances. The shoe is comfortable. 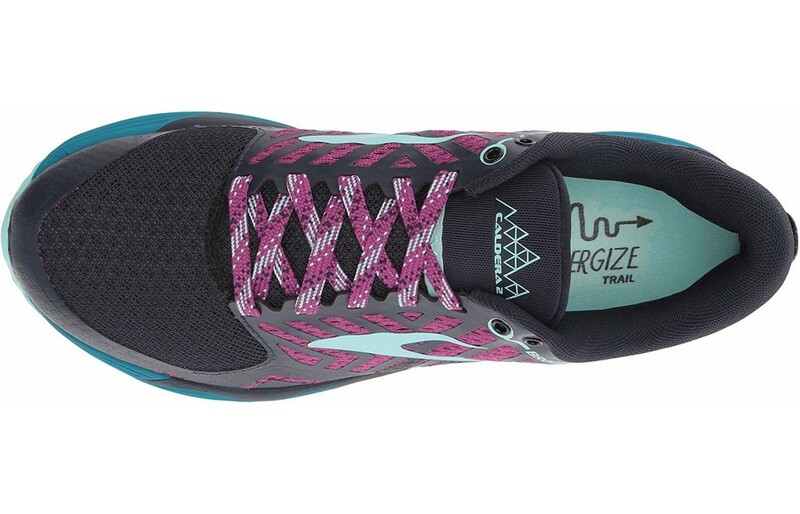 The same outsole used on its predecessor is found on the Caldera 2. A sticky rubber compound is used in the construction that ensures long-lasting wear. Reviewers commented that they were pleased to see the 3D hex-shaped gripping lugs on the outsole. They provide the most grip possible, including in snowy conditions. The outsoles safeguard the feet from potential hazards on the trail. Runners feel completely protected and stabilized. The 2 in the name represents both the recognition of an updated model and two Brook trademark technologies - DNA and BioMoGo. BioMoGo is a biodegradable and non-toxic material that adapts to the shape of a runner’s foot. The super viscous fluid of the DNA becomes stiffer when the runner applies more force — more durable comfort and greater flexibility result. The two features combined effect is cushiony, long-lasting support that adapts to the unique form and movement of the runner. Testers report the shoes are comfortable after running through difficult trails and long distances. Height has been added to the original for further protective measures and cushioning. The Calera 2 is a significant change from the Caldera 1. The upper features the trademark Condura knit mesh paired with Ariaprene mesh. Ariaprene is more durable and breathable than the original version. The environmentally conscious appreciate the material. Non-toxic and recycled rubber was used to create it. Condura is an overlay that provides additional sturdiness and warmth. The remainder of the upper is the same as before. The first version had issues with closing properly to get a good fit. The toe box was wide but not wide enough. It still felt better than the majority of shoes from Brooks. Version 2 hasn’t changed too much from Version 1. Stretchy woven material is still used for the laces, and the protective toe bumper remains. There is plenty of room in the toe box with a little bit of breathability between the toes. It does have more volume in the midfoot. Reviewers are happy with the neutral fit of the Brooks Calera 2. The Calera 2 averages 9.9 ounces in sizes for men and approximately nine ounces for women. Those weights are standard trail running shoe weights. The shoes have protective and sturdy features that are partially responsible for the weight. Brooks does not want their footwear to impeded or be cumbersome for long distance runs. The Caldera 2 strikes a balance that offers a secure fit without feeling weighed down or bulky. There are things about the shoe reviewers did not like. The shoe is fatter than the previous version and weighs more. It was described as a ‘plump little nugget.’ Each shoe weighs about a half ounce more than Version 1. A half ounce may seem negligible, but there is always a reason for extra weight. The Caldera 2 shoes are well-ventilated. Brooks exchanged the Neoprene upper of the original for a lighter Ariaprene. Reviewers have noted that the shoes are considerably more breathable. They also like that recycled rubber is used in the making of the outsole. It is decomposable when thrown away. Runners do not have to choose between breathable comfort or durable protection when running with these shoes on difficult runs. The shoes get dirty because the feet get sweaty and dirt collects. The wetness of the shoes is not always due to creeks and rivers. Testers did not agree upon the amount of comfort offered by the Caldera 2. They enjoy the long-lasting and adaptive cushioning provided by the midsole. Reviewers are grateful for the upper’s breathable protection. Runners who wore the shoe long enough to break it in, report feeling completely supported and comfortable regardless of the terrain. Those with wider feet did not enjoy the feature. They noted this version is narrower than the original. Breaking in the shoes still caused foot pain and blisters after a run. Version 1 received complaints that the shoe was too hot. It was not as breathable as reviewers would like. Version 2 doesn’t do much to improve on the issue. The mesh is improved for breathability, but it does not breathe as much as hoped. It is still a warm, hot shoe. The same style featured in the original model is maintained in the Calera 2. Newer technologies have been used, but the model retains the dark-hued upper material, tread pattern, and silhouette of the first version. Overlay design changed to an X-shaped pattern instead of diagonal stripes. A contrasting color is used to place the Brooks logo over the overlay design. A more colorful design replaces the gradient effect. Only one color for men and another for women is available. Navy/Plum/Icy Blue is featured for women and Black/Blue/Yellow for men. There are some questionable details on the shoes. There is a pocket on the tongue to tuck in the laces. Unfortunately, it is down in the laces, so there is no way to tuck in the laces unless the shoes are unlaced, which makes no sense. The heel counter comes back into the Achilles. If the runner has a sensitive Achilles area, the area is a bit stiff and could cause issues. There is a lot of thickness in the upper. Some of the stitched overlays were taken off and replaced with welded overlays. There are a lot of welded overlays and multiple layers of mesh that contribute to the heat factor. A bit of polish is missing from the shoe. Brooks has gained a reputation for creating long-lasting running shoes. The Caldera 2 works to maintain its status. Construction of the upper is optimized with a sticky rubber compound meant to withstand constant use on trails that are rocky. Its BioMoGo DNA midsole provides flexible support, adapts to the shape of the runner’s foot, and safeguards the feet from impact. Ariaprene is a breathable and lightweight form of rubber. The rubber withstands greater usage than the usual knit materials. When paired with Cordura knit mesh, the shoes are more durable and can hold up to rugged activities. The Caldera 2 does not have the Rock Protection Plate featured in the original model. Runners still feel protected from trail hazards. 3D hex-shaped gripping lugs and a sticky rubber compound on the outsole prove to be adept at safeguarding runners. The BioMoGo DNA midsole aids the cause further. It adapts to the runner’s foot and the terrain underneath. Reviewers felt the shoe was perfectly cushioned for long distance runs. The double-layered mesh upper keeps the foot warm during winter runs and cool in the summer. Durable Cordura knit provides warmth and lightweight Ariaprene breathability. The toe bumper gives the shoe more protection by safeguarding the toes from potential accidents and injuries. Customers find the shoes to be highly responsive. They have responsiveness needed for speed. The durable outsole easily grips wet and dry terrain such as paved roads, snow-covered paths, and mountain trails. 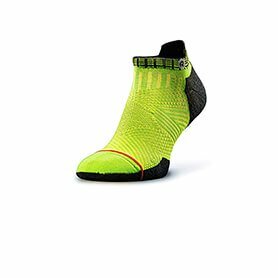 Due to the responsiveness, the shoe also provides a decent amount of protection from the ground that allows runs through more rocky or technical surfaces. The BioMoGo DNA midsole offers a cushion against rough terrain and much-needed flexibility. The upper does several things at once. It offers protection against debris and dirt, durable wear, and breathable comfort. Reviewers wish the outsole was more flexible to match the flexibility in the upper and midsole. The upper is not waterproof. The supportive nature of the Caldera 2 begins with the rubber compound outsole. It provides a durable and secure base so that runners can move safely. The midsole takes on the bulk of the support. It provides flexible and responsive cushioning that adapts to the runners’ movements and the terrain where they run. The dual-layered Cordura knit and Ariaprene upper are sturdier than typical knit mesh. Additional structure is provided by synthesized rubberized overlays that ensure the shoes maintain their shape. Padding around the tongue and collar and support to the ankle and keep the foot in place. Quality trail running shoes perform well on various terrain. They help runners move safely under different weather conditions. The Calera 2 performs well for runners at all levels. Runners feel secure running on mountainous terrain, forest trails, and across dirt and mud whether the surface is dry or wet. Many run through snow without feeling the risk of slipping. The shoes do not feel cumbersome on paved roads. New trail runners can work their way up to more difficult trails slowly. The $140 MSRP seems a bit expensive, especially to first-time runners. However, it is considered average for trail running shoes. The high-quality of the features and overall durability make the shoes worth every penny. Terrific deals are available on Amazon. Incredible traction is a trademark of Brooks running shoes. Caldera 2 does not disappoint. It retains the 3D hex-shaped gripping lugs used on the original Caldera. Runners feel secure when running on rugged terrain in wet or dry conditions. The size and shape of the tread pattern permit runners to transition unimpeded to paved roads. It does well on roots and rocks. The shoe has enough lugs to give the grip when needed but doesn’t trip up the runner with too much outsole for long distances. Flexible wear is a feature that many trail running shoes cannot provide. Caldera 2 shares the disadvantage. The upper and midsole offer ample amounts of flexibility. The outsole does not. Many runners find the shoe to be too stiff. Constant wear slightly fixes the problem. The smaller than average fit heightens the situation. 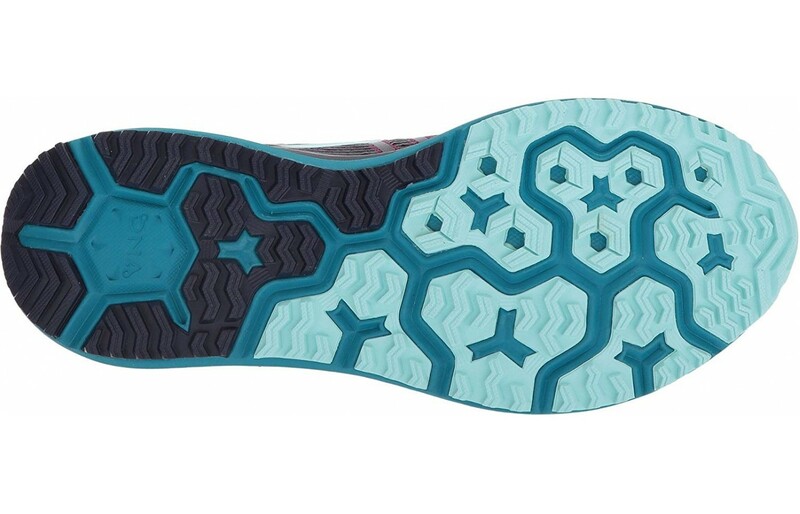 The tread pattern of the outsole provides a very stable run. Its firm grasp on paved roads, snow, rock, and mud ensures the runner feels agile and secure. The BioMoGo DNA helps with durability and cushioning. Synthetic rubberized overlays help in maintaining the shape of the foot and keeping it in place. Stretchy woven laces are used for a secure, customized fit. Caldera 2 has a low drop platform. The heel-to-toe drop is four-mm. Its overall height was raised three-mm. It is a subtle yet noticeable increase to the cushioning level. Trail running shoes usually have zero or low drop platforms for better posture and balance. They allow runners to have greater control when running across rough terrain. 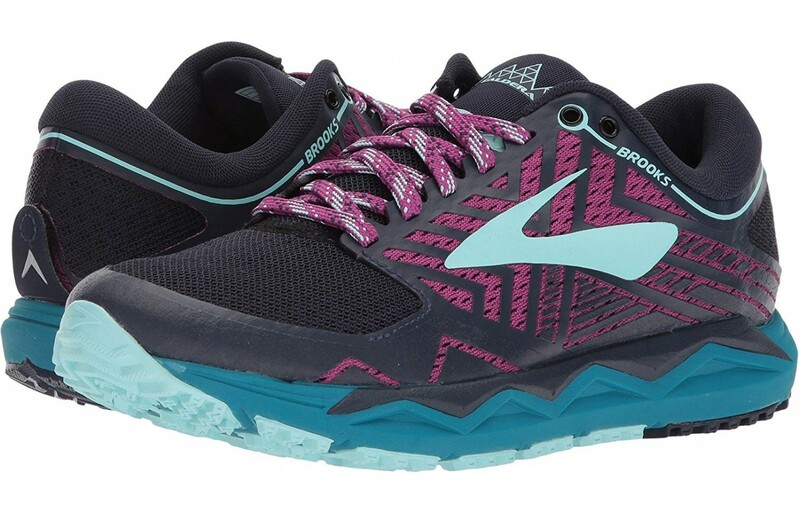 Runners are pleased the updated Brooks Caldera 2 model is similar to the original. It has the same upper silhouette, midsole, and outsole. The Brooks Calera 2 has been on the market for a while. 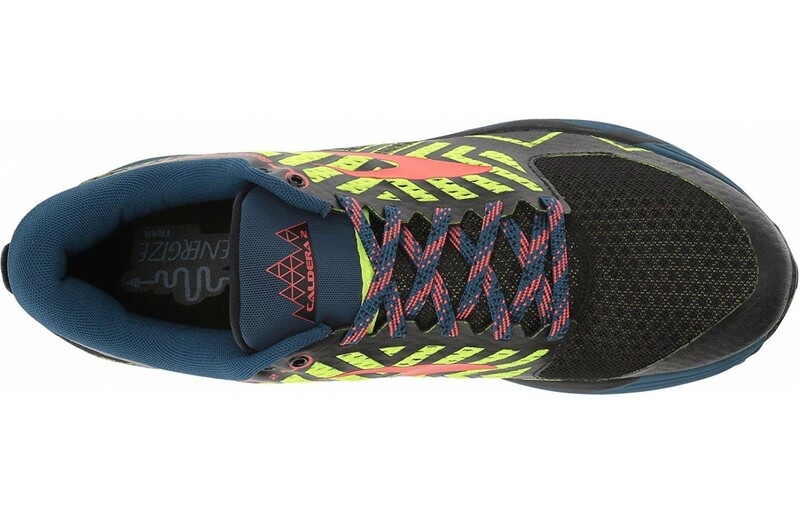 It is a neutral trail runner positioned somewhere between the Cascadia and Mizuno. The shoes have middle cushioning, decent fit, and decent durability. The shoe is not great, but it’s not terrible. It looks plain, but it’s an excellent shoe. The shoe gets the job done without a lot of flash. It is a moderately cushioned and decently treaded trail running shoes for all the adventures, long runs, races, or training. Changes occurred in the upper. There is new mesh, overlays, welds, lacing system, and tongue. The redesign does not necessarily mean it is a better shoe. There are features reviewers liked and disliked. The cushion is due to midsole materials known as BioMoGo and DNA. The technologies provide an excellent balance between response and cushion.